Monica certainly had her hands full when she took my husband and I on as clients! We recently executed an international move from the UK, and had to move over Christmas. Monica came highly recommended, and we contacted her during the summer. I was very worried about moving at Christmas, and trying to find a house we would love during the winter months. Monica reassured me that she would work to find something perfect, and she certainly did!! We found a house we love in o...ne of the listings she sent us, and proceeded to conduct all of the offers, paperwork, etc. from the UK. She was so amazing, making lots of time for calls, meeting with our friends to walk through and inspect the house, and kept us fully in the loop and kept us calm through it all! Even after the deal was done, and after we had moved into the house, Monica followed up to make sure we were happy. I can't say enough good things about her, she is FANTASTIC!! 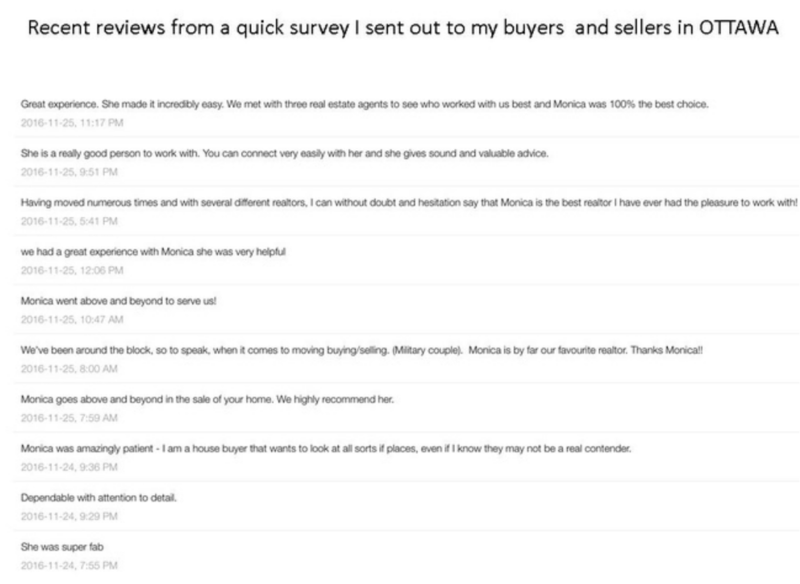 If you are looking to buy a house in Ottawa, Monica is #1! Monica is simply the best. She was our buying agent in Halifax and our selling agent two years later. She is professional, knowledgeable, always prepared for anything, and simply fun to work with. When she came to Ottawa we had no reservations recommending her to anyone and everyone. No need to search any further for an agent - they don’t come any better than Monica Haddow! Monica is a house buyer's angel. I don't know what I would have done without her! Because of military obligations I had to find a home without my husband. She was an amazing support and resource. She is patient, professional and very knowledgeable. Monica knows how to anticipate needs and educates her clients. She is not only a great realtor but a great person as well! Monica is professional, empathetic & hard working. She works with her clients best interests at all times. She is honest & will provide you with amazing customer service. Highly recommend! Monica was so fun to work with! She was never pushy and always available to go look at homes in any direction of Ottawa and we weren't set on any given location. We will definatly be calling her again when we are ready to sell our first home and m search for our next! 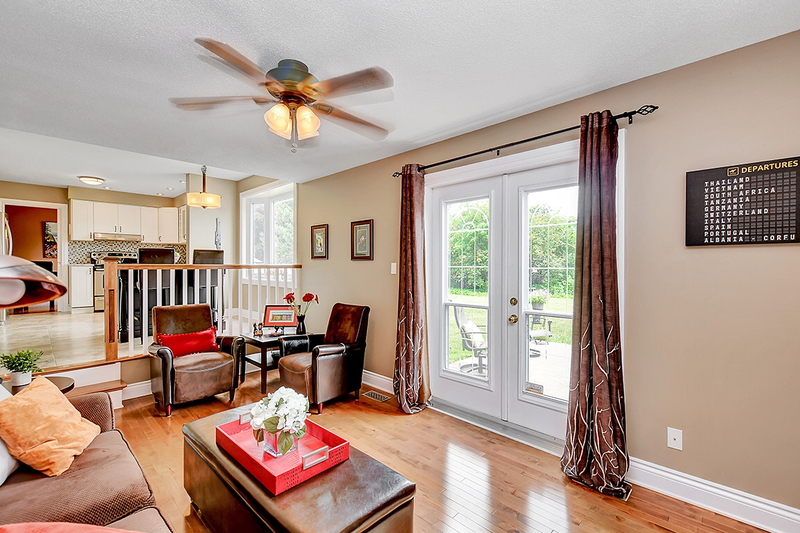 "We have worked with Monica Haddow from RE/MAX on the purchase of a home as well as on the rental of two other homes. She is the consummate professional. If we live to be 100 years old, she would absolutely be our agent. Her attention to detail is meticulous and timely! When there was new information, it was INSTANTLY conveyed to us. Monica proactively addressed any potential "glitches," thus making sure they didn't occur. Every real estate dealing with her was smooth and seamless. Her engaging personality has left us with a deep sense of personal friendship as well as professional association. We feel that anyone needing a relator would benefit by enlisting Monica Haddow from RE/MAX as their agent." Jim and Mary Pat Hollis- "Monica, we mean every bit of this - you have been AWESOME!!!!!!!!!!!!" "I can't not put into words how happy we were with the service provided by Monica Haddow. Her customer service, knowledge and attention to detail is second to none. I will refer her to anyone friend or stranger, who is thinking of buying or selling real estate." "Monica Haddow is a great representative for Re/Max realtors, she is business like, but kind and sensitive to other people and smart. She has helped me get through a troubling sale working with patience and logic. If you need a realtor, I highly recommend Monica. Thanks Monica." Monica Haddow is not only an amazing person to know, but she is an excellent Realtor! She did all the research necessary to sell our house and SOLD it in 3 days! We are very satisfied with our agent and agency!" "Our Sales person Monica Haddow had a wonderful personality and a go get attitude, which also made us decide to use her. I would recommend her to anyone that is looking for a home in the area that she works." "Thank you" The Martels...."very pleased!!" "We loved Monica Haddow. She was a real person whom we could relate to. We grew fond of Monica and her confidence gave us confidence and we knew we could trust her with our best interest. We have already referred people to her and we would definitely use her again." "We were on our house hunting trip when we found out our water-well required drilling. Thanks to Monica’s dedication and quick thinking, work began immediately and disaster was averted - she even oversaw the work while we were away! The sale of our house was completed by the time we arrived home." Monica was amazing to work with! And her knowledge of military moves was key. We had a small window to move within and she got is there! I'm happy to call her a friend now.